A natural-gas power plant that was a converted coal-fired power plant has been shut down in North Carolina. Coal was retired from the plant in 2013, but five feet below a steel wall is coal ash from pre-2013. The Cape Fear River overcame the dam at a cooling pond. While a Duke Energy spokesperson said they do not believe that the coal ash entered the Cape Fear River, they couldn’t rule it out either. However, alumina and silica did enter the river. The plant has been shut down until the situation can be resolved. 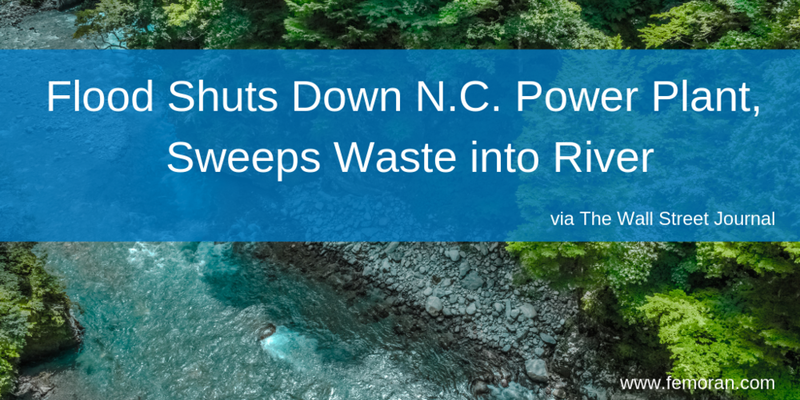 River flooding caused the shutdown Friday of a natural-gas plant near Wilmington, N.C., after several breaches in a cooling lake were discovered and some waste tied to the facility’s past as a coal-fired plant entered waterways. Duke Energy Corp. said Friday that the rising Cape Fear River overtopped the dam at a cooling pond next to a coal-ash landfill at its L.V. Sutton Power Plant. The plant burns natural gas after coal-fired units were retired in 2013. The company believes the coal ash—which was about 5 feet below a steel wall at last check—is still contained, but Duke Energy spokeswoman Paige Sheehan said she couldn’t rule out the possibility that coal ash was moving into the Cape Fear River. The company said another type of waste from burning coal to generate electricity—lightweight hollow beads of alumina and silica known as cenospheres—was entering the river, and environmental groups warned people to stay out of the affected water. The company said the plant provides enough electricity to power 500,000 customers, but that customers would not be affected by the outage. Older PostFire Panels: What is your trying to tell you?